Learn how to solar cook like a pro, how to eat more healthy and save money in the process, all while cooking with the power of the sun. Learn about world wide initiatives to promote solar cooking in war and famine ravaged countries and how you can help to promote a cleaner, safer environment for many of the world's destitute. Learn of, and take advantage of solar cooking opportunities right here in our own country, right in your own back yard. Learn of the latest advances and changes in the world of solar cooking and how it might benefit you and your future. Continue reading "Tubes or boxes?" Continue reading "Just about any old junk will do." Continue reading "Safety for solar cooking"
Continue reading "Will heating water in a sun oven evaporate the chlorine etc.. in the water? " Continue reading "easy emergency solar oven"
Continue reading "Science project Solar cooker for 7th Grade"
Continue reading "My Thermal cooker (haybox)"
Continue reading "Puerto rico needs these!" Continue reading "A decent oven. " Continue reading "Educate the children, they will educate the adults. A nation wide essay contest on the urgency of introducing solar cooking. Prizes for each age group. That is how we sold war bonds! " Continue reading "SURYAKUMBH-THE WORLD'S LARGEST SOLAR COOKING FESTIVAL"
Continue reading "Permaculture Journey with Solar Oven"
Continue reading "The solar pizza box"
Continue reading "What is a solar oven's favorite song?" Continue reading "Chemically induced allergy sensitization"
Continue reading "GoSun Grill Is HERE!" Continue reading "go sun grill"
The All American Sun Oven Christmas package is available starting now through Christmas. Get the best deal of the season with our AASO Christmas Package! Continue reading "New AASO Christmas Package Now Available"
Have you seen the new TR-86 Reflector Panels from Solavore? They have an 86% reflectance rating and are top quality! Come see them today. Continue reading "New Solavore TR-86 Reflector Panel"
Continue reading "Silver Balloon Solar Cooker"
Protective covers allow you to get more years out of your investment. Protective covers for the parabolic will help protect against offshoot sun rays creating fires! 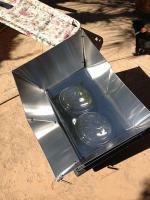 The newest solar cooker on the market is the Silver Balloon Solar Cooker. Great solution for backpackers, campers and hikers. It is the smallest solar cooker we carry and the lightest weight. September 2016 is National Preparedness Month And We Have You Covered! Continue reading "National Preparedness Month"
Buy a Cooker get a Cover free! Solavore has a few new accessories that are worth looking at! Take a few moments and you will be impressed with what is now offered. Continue reading "Awesome New Solavore Accessories"
Continue reading "New Sun Oven Page"
Continue reading "Pizza Box Cooker"
Continue reading "can you use a camp style percolator coffee pot on a solar cooker"
Continue reading "Rusted out panel and broken pot holder "
Continue reading "2 Quart canning jar "
Continue reading "which variables found when making a solar oven"
Continue reading "routine use of box solar cooker"
Continue reading "Hot Pot Panel Solar Cooker"
Continue reading "Reflective Vinyl for building a solar cooker"
Continue reading "All glass solar cooker"
Continue reading "Will It Run A 5 Liter Pressure Cooker"
Continue reading "My Last Solar Cooker"
Continue reading "Just an observation, really"
Continue reading "The Kemp solar window oven"
Continue reading "I need to make a solar cooker for boiling water what type of solar cooker should I use"
Why should we solar cook? What are the benefits of so doing? 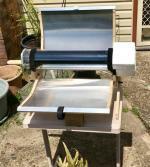 Continue reading "Why Solar Cooking?" This small, compact and lightweight parabolic cooker will do a great job cooking anything you would cook on your electric stove top. Continue reading "USA Made Solar Parabolic Cooker "
Continue reading "Are there any chain stores that sell solar cookers?" Continue reading "Direct Solar Heater"
Continue reading "ASSC for non profit"
what should be angle between two parabolic reflector base? Continue reading "what should be angle between two parabolic reflector base? "